What does the P0344 code mean? The P0344 trouble code is indicating that the engine control unit was/is getting a faulty signal from the camshaft position sensor. The code is telling is that the problem was intermittent and it may not still be there. A trouble code can be stored in the engine control unit for a long time. The p0344 is an OBD2 Generic trouble code which applies to all car models and makes from year around 2000. You may find other camshaft related trouble codes with the P0344 code. Some examples are P0341, P0342, P0343. The codes are very similar, the difference is what kind of faulty signal the engine control unit has detected. Some engines do have several camshaft sensors but do normally just have one. Sometimes you get bank information from your trouble code if you are having a V-engine. If you get that information, the bank 1 is located at the cylinders 1-3-5-7-9 and the bank 2 sensor is located at the cylinder 2-4-6-8-10 and so on. 4-stroke engines crankshaft do rotate two turns per cycle and the camshaft sensor is rotating one turn per cycle. A lot of older vehicles do only have a crankshaft sensor. Because of that, the engine control module will not know which of the turns the engine is at. Because of that, the engine control unit is firing the ignition coils two times per turn, called “Wasted spark”. With a use of a camshaft sensor, the engine control unit does only have to fire the injectors and ignition one time per turn. Because the p0344 code is telling us that the problem is intermittent. You will most likely only have a check engine like as a symptom. But there could be some other symptoms if the problem is permanent. 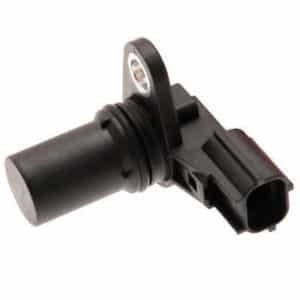 The most common cause is a faulty camshaft position sensor, but you should always check the wirings and the connector before replacing the sensor. The problem could also occur to a low-battery voltage in some cases. A common misdiagnosing is to start checking the camshaft timing. This code is telling is that there is a problem in the electrical circuit and not a problem of the camshaft timing. If you have noticed that your car had low voltage before at some point. Charge your battery and erase the P0344 trouble code to check if it’s coming back. Sometimes it can be that easy. This is a guide to how a skilled automotive technician would diagnose this trouble code. It may require some car electrician skills and require some tools. Because the trouble code is intermittent, you fault may not occur when you are diagnosing it. But it’s always good to check it. Always connect a Charge your battery to your vehicle before starting doing any troubleshooting. I do recommend to get a charger that is charging over 4 amperes. If you are troubleshooting with the ignition ON a lot, it may drain your battery if it is not giving enough power. Connect an OBD2 scanner to your car. Verify the P0344 code. At this moment you have two options, either erase the trouble code and charge your battery and hope that it is not coming back. But I do recommend that you diagnose it properly to see if you can find any problems. Locate your camshaft sensor. It is located anywhere near one of the camshafts. You can see an example picture of a camshaft sensor at the top of the article. You have to identify if you have an hall sensor or VR sensor for the next tasks. Hall sensor = 3 pins/wires and VR sensor = 2 pins/wires.
. Check for any oil leaks around the camshaft sensor and clean it up if it’s a lot of oil around it. The hall sensor uses three wires. One 5 volt power supply, one ground and one signal wire. Check if you get 5-volt power with a Digital multimeter. Check if you get 5-volt on the signal wire with the ignition on and the connector unplugged. Check if you have ground on the ground wire. If you have all these, your camshaft position sensor may be damaged. The VR sensor uses two wires. One signal wire and one return wire. The easiest way to check this sensor is to measure the ohms between the two pins on the sensor with the connector unplugged. Unplug the Engine control connector and find out which two pins are going to the sensor. Do the same procedure with the connector plugged in. You should get the same ohm’s here, maybe a bit higher due to the length of the wires. If you are getting 0 or nothing here, there might be a problem with your wirings. Read the DTC code memory: FOXWELL NT301 Scan Tool. For advanced troubleshooting, you may need a more advanced code reader. If you have any other questions about the P0344 code, comment down below and I will answer you as fast as possible. If you have any other car questions you are welcome to ask us at our homepage.